I ART U: happy haul-idays! the holidays are around the corner!!! and chronicle books is hosting the raddest giveaway! the steps are easy. what are you waiting for?! ready, set, GO! making my list was super duper easy. i've had my eye on so many of these books! cart total: $496.40!!! alright, your turn! let me know if you make a list so i can come comment on your post! oh and have an amazing weekend!!!! holy crap!!! i know what my next post is going to be about!!! woohoo! how amazing is this?! i think i must make up a list. thanks! Gaaaaaaaaaaaaaaaaah. Only open to US residents. I think I need to buy a second home in the States... hahahaha. I love this. I am so excited to make a wishlist! what a great list - and what a fun giveaway!! I want! I want! I've wanted The Exquisite Book (several copies) for myself and friends. I HAVE TO DO THIS! Thanks so much. I love this list. Good luck! I love Chronicle Books soooo much. ohhhmygoodness. thank you so much for sharing this. not only does this look fun to win... but just to put together, even! ahhh. my milk toof? adorable. oooh SO awesome! thank you for sharing! great picks! hope we win! oh wow, love your picks. these would be amazing! Go comment on mine and let's hope we win!!!! I am totally gonna blog about this. This contest is such a great idea. Your list is great. I would love all of these books. I love your list so much! Even though I think I own a lot of Chronicle books there are always so many more that I want! your list of books is amazing! now i need to get to work on a list of my own..
i made one too, jennpoo! Awesome picks! Thanks + good luck! Your list is terrific! Love the cookbooks. Oh, I must get working on this as soon as possible. Thanks so much for the heads up! Did you have a wonderful weekend? I LOVE books....... LOVE! I just bought The Exquisite Book - it's awesome! I am SO kicking myself for missing the Pictorial Webster's! That's one of those "someday" books for when I actually have a $500 free pass just to spend on books. Good luck! What an awesome idea! Great list! I have that Tartine book but I'm not a baker so I haven't made any of the goodies, I just look at the pretty pictures, haha! I'm definitely making one of these lists, I'll comment again whenever I finish mine. Awesome list of books! You have several on your list that I wish I would have added to mine! My post is up...I wasn't as able to stretch my money as far as you were, HA! Good luck! Ur number 12 is AWESOME!!!! I love the MILK TOOF!!! I LOVE your list!!! I want every single book on it. I made a wishlist! Feel free to come check it out. NICE. gotta do this too! I am dying over the milk tooth book, adora-ble! Love your choices! I love Milk Toof, so cute. Good Luck! This is such an awesome giveaway. Love your list. 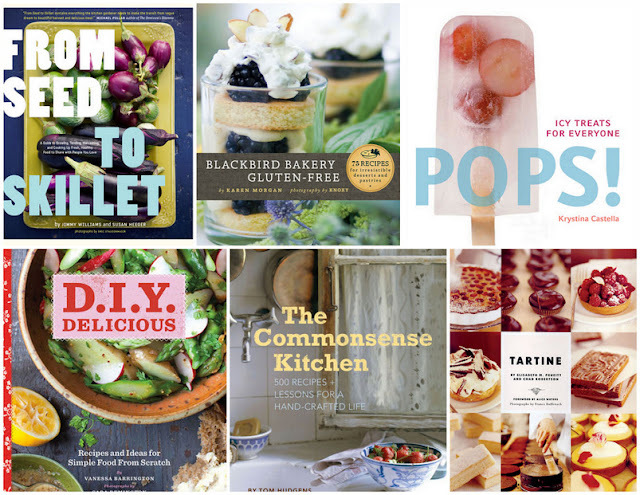 Great cookbooks! Very cool list! Cooler than mine lol! Good luck! What a wonderful list! I see some great gift potential here! Wow great giveaway. You've chosen some very inspiring books! 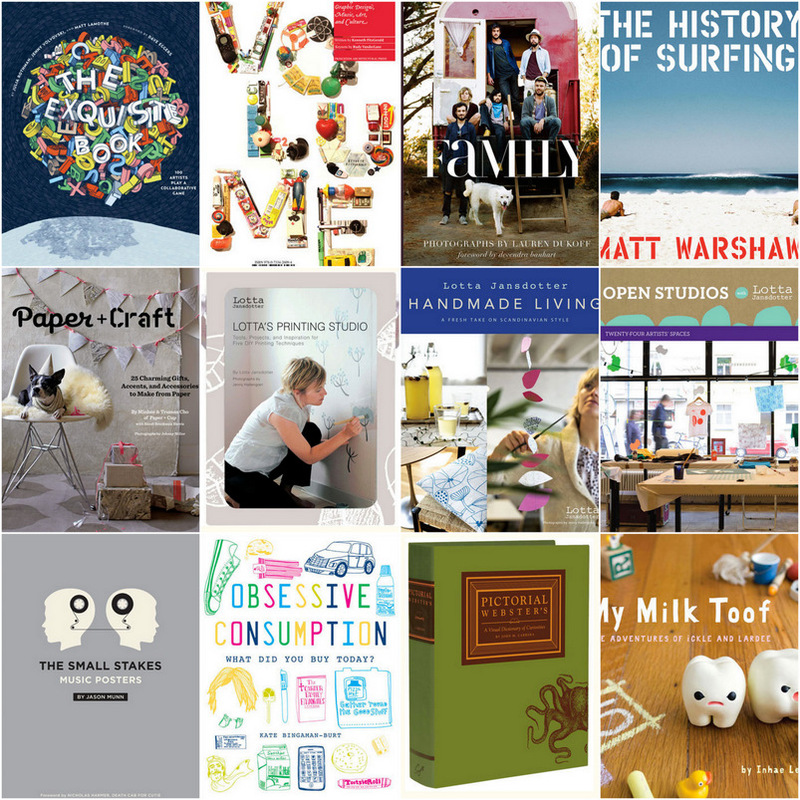 Great list - interesting mix of cookbooks and design books. I love Chronicle - this is such a generous giveaway. great list, I would love to give the HIstory of Surfing to a friend. I love your list! I hope you win!!! Stop by my blog to check out my list too! Interesting list of books! Thank you for the chance to win this wonderful giveaway! I absolutely love this list and especailly the Obsessive Consumption title. Thank You for the chance to win! Awesome list.. equal parts delicious and crafty! Oh yes - love Lotta! Some gluten-free cooking for my sis, some crafting for me - sure would love to haul it one home with you. Good luck! So many great books in so many interesting categories! What fun! "i art" your list! especially the 'family' portrait book, the tartine cookbook (their bread pudding is to die for, but i don't have the recipe) and the pictorial webster's seems a perfect gift for my niece and nephew :) - good luck! I had a great time doing this...and finding new blogs! Awesome list--very eclectic. Very similar in spirit--for the most part--to the ones I selected See My List Here . I would absolutely love to win either one. what a great list! here's hoping we win! I knew from your blog name, I'd love your list! Great list! Best of luck. great list! good luck to you! Man this is such a great contest. Good job Chronicle Books. Also, your list is amazing. So so much good stuff on there. Wow, thanks so much for sharing this!! I'm creating my list for tomorrow!! :) You have a great list too! Thanks, Jen!! Oh, this is the best list. I have been eying at least half of those books already and am excited to check out the other titles! Thanks so much. I'm working on putting together my own list now. what a great list! I would love any of these! this is an awesome giveaway. I am working on my list now! I love the books at chronicle books! From Seed to Skillet and the Pictorial Dictionary are at the top of my list! Two words about this list... Yes Please! LOVE this giveaway and your book choices! Now I want to make a list too. Awesome! I will definitely be making my own list! I hope you (and I) win! WOW I love this contest. Thanks for giving us a chance to win with you. How totally awesome! Can't wait to make my wish-list! awesome!! i love all the choices. what a great post (and a fab giveaway idea)!! Wow, I have never gotten that many books at once! It would make my month, for sure! Wow! I seriously think I would cry if I won all these books! Visiting from Oh, hello friend. You can comment on my list at http://thegirlnamedtennessee.blogspot.com/2010/12/celebrate-haul-idays-with-haul-of-books.html. Good luck! loves it! i've got one too! what a great list! good luck. I'm going to go make my own list now! ooo! snazzy idea by Chronicle! Wow. Great list. Not one I wouldn't want!! Love the gluten free cookbook selection! what a great list! fingers crossed you win! Fantastic list! My favorite are Lotta's printing studio (can imagine learning loads of new things with it!) and From seed to skillet (I love to cook!) Fantastic giveaway!! Amazing list! I love your pics! Great list. I hope you win! I love how diverse your list is and it makes me hungry. I love books and Chronicle has so many amazing ones. Thanks. Loving the food books d.i.y. delicious and from seed to skillet. oh I love your list! Especially the "to eat, to make" books as I love to cook too! Ooh, that Obsessive Consumption book looks really interesting...I keep seeing new cool stuff on everyone's lists! Good luck! what an amazing list!!! Thanks for the gift ideas...good luck! This is the YouTube Video on the book From Seed to Skillet. I really want to win this book. Jimmy Williams recently had a book a book signing in Hollywood at AMMO restaurant where his recipes were served. You can also leave a comment on my blog jaxiejax.com for a chance to win. Good luck to us! This book is on my list too. I think your book taste and my book taste are 100% similar. Wowza, having all these would so awesome, I wouldn't leave the house for 3 weeks. I am going to make my own list now! But I love your list. Such lovely choices!! A few of those books are on my own list! In LOVE with your list. Good luck. I love your list, good luck! Good selection of titles. Good luck to both of us. And Thank You to Chronicle Books. good job! hope we win! What a great list of books! So so many lovely books! Must make my own list! Love Chronicle Books and LOVE your selection! great list! good luck to both of us!